My son Tobias is 17 years old and has been chosen to be one of 120 students participating in Students on Ice for the 2018 Arctic Expedition. Students on Ice (SOI) is a unique initiative dedicated to taking students from around the world on once in a lifetime educational expeditions to the Arctic and Antarctic. The ship-based program takes high school and university students from around the world to the Polar Regions to gain a deeper understanding of this unique and important part of our world and to educate, inspire and empower youth to make a difference on a local and global scale. Students on Ice is the only organization in the world which offers an opportunity for students to be immersed in hands-on research activities and lectures, taught by Polar experts, scientists, Inuit Elders, artists, musicians, historians, educators, and explorers. You can learn more by reading the story on his GoFundMe Campaign. This quote is from when Tobias was about 7 years old. 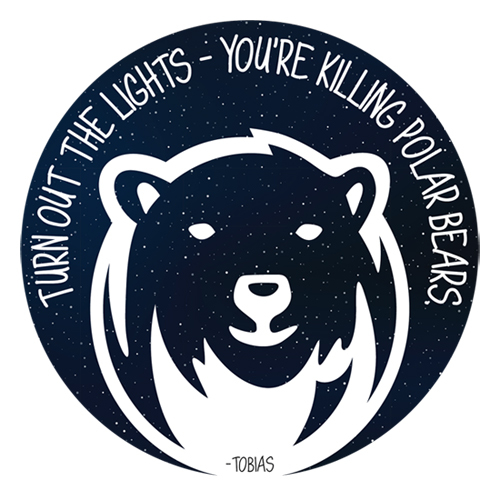 He watched Arctic Tale and for well over a year after would tell us to “turn out the lights… you’re killing polar bears!” This story was the opening to his application for Students on Ice too. Just when I thought I’d never hear him say that again… lol. 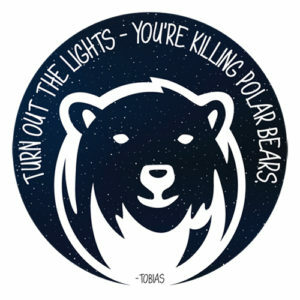 These vinyl decals were created to raise money so that Tobias can participate in this rare opportunity. Decals measure between 4 and 5 inches round. They are $10 CAD (that’s just under $8 US) each including mailing costs in North America (if you are overseas please contact me). To order please use the PayPal button below. If you are in Canada and wish to use etransfer please send a note to creative@lauriemarch.ca.